New website. New logo. New brand. New WebPraxis. We’ve launched our new responsive website today along with a new logo and brand for the company. We’ve been thinking hard over the last few weeks trying to come up with a logo and tagline that sums up what we do here at WebPraxis. ‘Praxis’ mean process and the online marketing process was something that we thought long and hard about. We really liked the recent ‘distance from perfect’ article on the Moz blog, essentially saying that all your online marketing activity and web development should move you closer to the perfect website. Eventually we came up with the tagline – optimise. track. refine. repeat. We required a logo that worked well across a multitude of devices and smaller screens sizes, as well as being simple enough to render nicely on both light and dark backgrounds. After a series of initial designs we choose the Montserrat font from Google fonts so that it could be used throughout the website. We also adjusted the kerning of the lettering and rounded off the edges slightly for a softer feel. Our logo symbol builds on the ‘distance from perfect’ idea essentially representing the W&P of WebPraxis as well as a digital marketing maze, and our clients finding the right route through the maze. We have to thank the extremely talented Adam Grüning for his collaboration on the logo and fantastic black & white series of illustrations. We’ve chosen a four colour palette used to create the gradient in the logo symbol and connect all our branding moving forward. The striking colours contrast with the simple sketched black and white icons we have created. We’ve avoided using .svg images on previous website projects due to certain older browsers not supporting them. We’ve taken the plunge with our own site and utilized .svg so that there is no loss of quality whatever size we render our vector based images at. We have also created a series of custom glyphicons based on the icons. 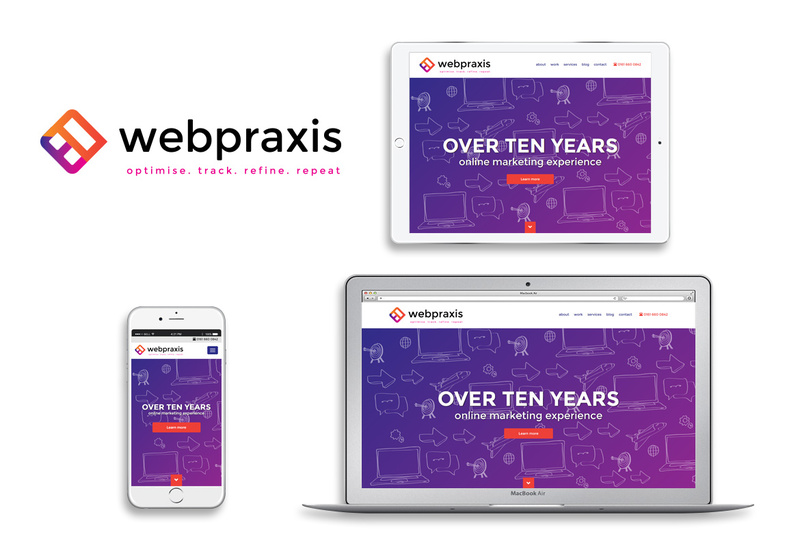 We are celebrating our tenth anniversary here at WebPraxis and fingers crossed the the new brand and website should serve us well for the future.